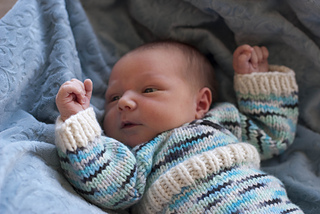 Update 1/12 - My son is modeling the Toasty Sleeper in the pattern photos (Dashing Dach’s Oyster Rock colorway). He is 1 week old and 8lbs. Update 11/11 - I have updated the sleeper pattern with the following: increased the body length, increased suggested yardage, and also fixed a decrease error at the waist. I designed this sleeper to be easy to put on baby and to provide quick access for night time diaper changes. The Toasty Sleeper is a quick knit, with the body worked in the round on 16” circular needles and the front and back panels knit flat and grafted at the top. The sleeves are knit by picking up stitches and worked in the round on either DPNs or 12” circulars. 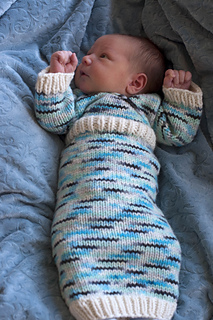 I knit this sleeper with the intention of using it as a wool soaker over a cloth diaper; however, I think it would knit up lovely with soft worsted or aran weight cotton or acrylic yarn as well! Tip - If you’re wanting to make this a bit larger you can try upping your needle size and/or yarn weight and knit for a bit longer than the recommended amount before the waist decreases. I’m releasing this out with limited testing, so if you have any questions please don’t hesitate to contact me at RhinoKnits@gmail.com.